Keep your everyday look on-trend with the eye-catching Anne Klein Kandis slide. 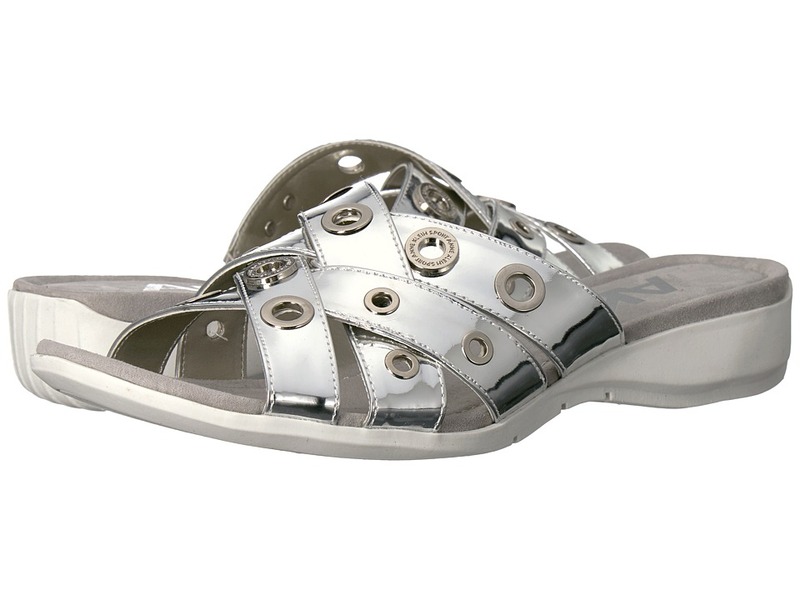 Man-made upper with metallic grommet detail. Open toe. Slip-in wear. Textile lining and footbed. Lightly-padded footbed. Contoured heel. Rubber outsole. Imported. Measurements: Heel Height: 1 1 2 in Weight: 8 oz Product measurements were taken using size 7.5, width M. Please note that measurements may vary by size. Weight of footwear is based on a single item, not a pair. 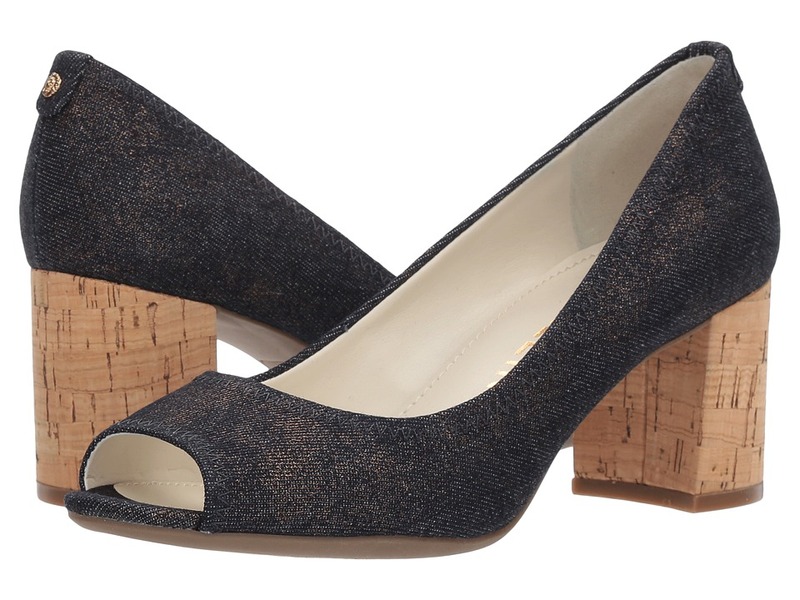 Bring a bonny bow to the party with the simply styled Anne Klein Honora peep-toe pump. Textile upper. Slingback ankle strap. Square-toe silhouette. Bow accent at vamp. Man-made lining and footbed. 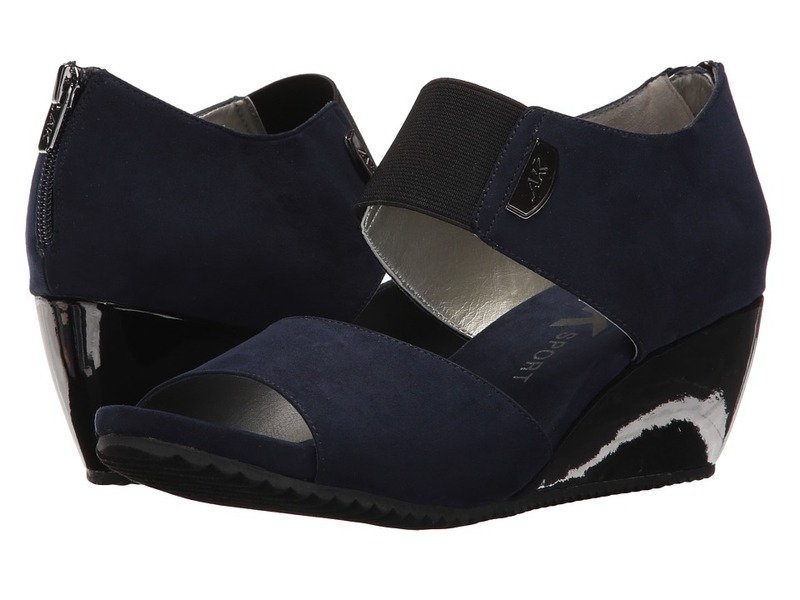 Contoured wedge heel. Man-made outsole. Imported. Measurements: Heel Height: 1 3 4 in Weight: 5 oz Product measurements were taken using size 8, width M. Please note that measurements may vary by size. Weight of footwear is based on a single item, not a pair. Swirl around in strappy style with the Anne Klein Ileane heeled sandal. Strappy leather upper. Heel strap with adjustable buckle closure. Almond-toe silhouette. Man-made lining and insole. Lightly padded footbed. Man-made sole. Wrapped stem heel. Imported. Measurements: Heel Height: 3 1 2 in Weight: 8 oz Product measurements were taken using size 7.5, width M. Please note that measurements may vary by size. Weight of footwear is based on a single item, not a pair. Slip into chic style this season with the Anne Klein Toria wedge slide. Fabric upper with crisscross panels. Slip-on design. Round-toe silhouette. Textile lining and footbed. Lightly-padded footbed. Wrapped wedge heel. Rubber outsole. Imported. Measurements: Heel Height: 3 1 4 in Weight: 6 oz Product measurements were taken using size 7.5, width M. Please note that measurements may vary by size. Weight of footwear is based on a single item, not a pair. 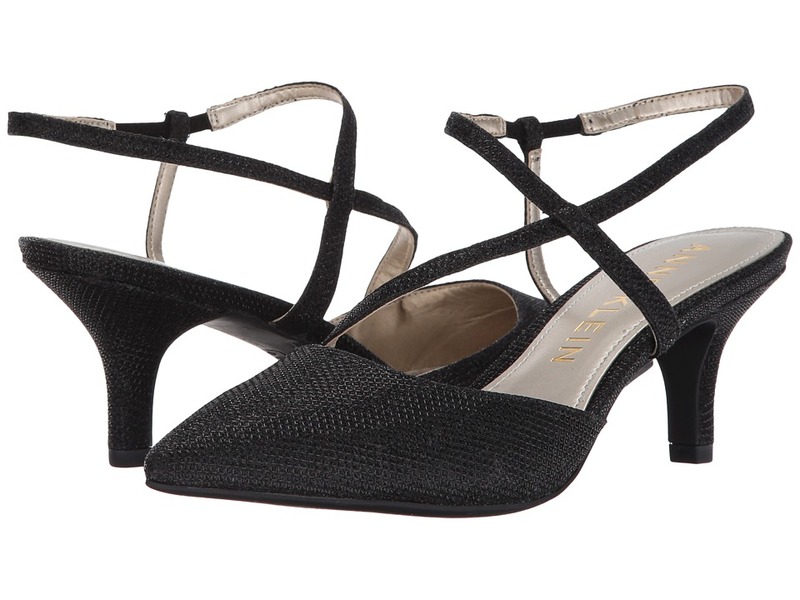 The Anne Klein Unitee is the perfect flat for your unique style. Man-made upper. Square toe. Easy slip-on wear. Man-made lining. Lightly-padded footbed. Synthetic outsole. Imported. Measurements: Heel Height: 3 4 in Weight: 6 oz Product measurements were taken using size 8, width M. Please note that measurements may vary by size. Weight of footwear is based on a single item, not a pair. A sleek simple style boasts a high level of sophistication in the Mallory wedge from Anne Klein. Textile upper with metallic stud detail. Ankle strap with adjustable buckle closure. Round-toe silhouette with caged design. Man-made lining and footbed. Cushioned wedge heel. Man-made outsole. Imported. Measurements: Heel Height: 1 1 2 in Weight: 6 oz Product measurements were taken using size 7.5, width M. Please note that measurements may vary by size. Weight of footwear is based on a single item, not a pair. Give everyday glamour a go with the wonderfully wearable Noreena sandal. Fabric upper with tassel detail. Ankle strap with adjustable buckle closure. Round-toe silhouette with crisscross construction. Leather lining. Lightly-padded footbed. Low stacked heel. Rubber outsole. Imported. Measurements: Heel Height: 1 in Weight: 7 oz Product measurements were taken using size 8, width M. Please note that measurements may vary by size. Weight of footwear is based on a single item, not a pair. Add a touch of posh perfection to your seasonal wardrobe with the Peppie heeled sandals. Leather upper. 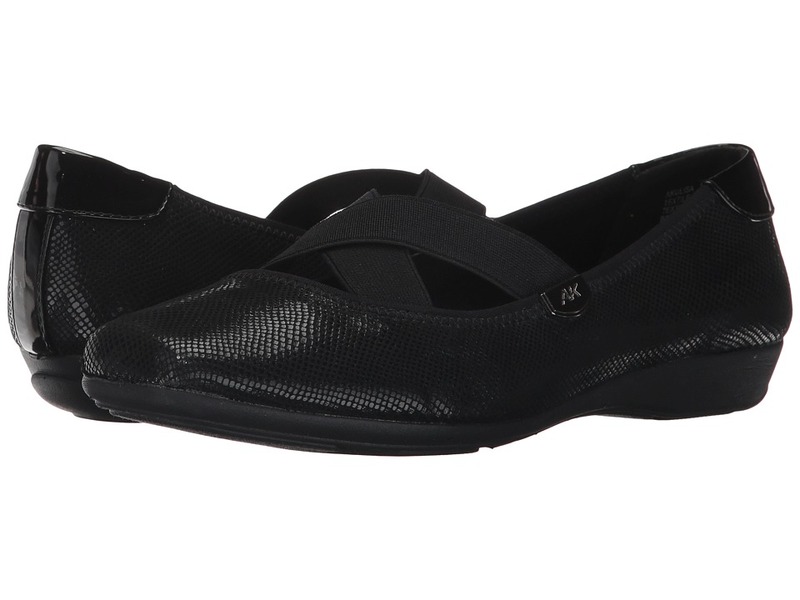 Slip-on design with elastic slingback strap. 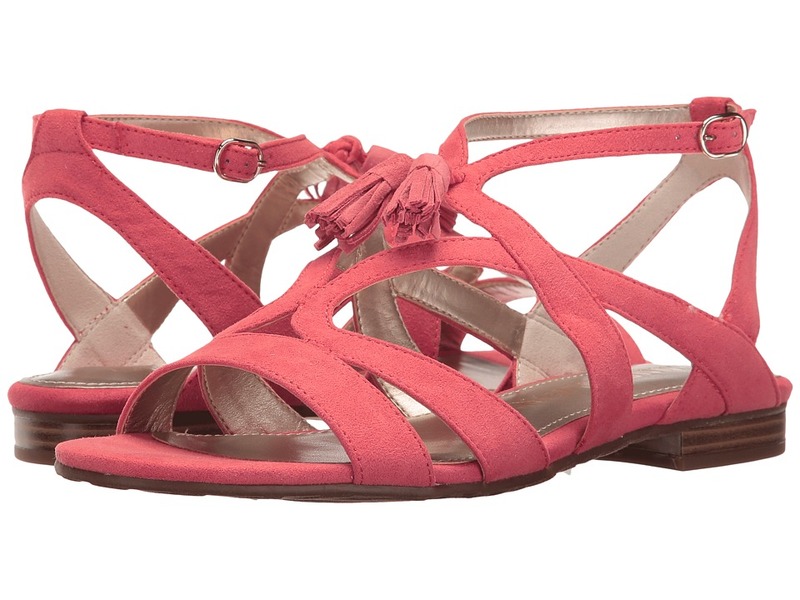 Round-toe silhouette with strappy construction. Man-made lining. Lightly-padded footbed. Wrapped block heel. Man-made outsole. Imported. Measurements: Heel Height: 3 1 2 in Weight: 10 oz Platform Height: 1 2 in Product measurements were taken using size 9, width M. Please note that measurements may vary by size. Weight of footwear is based on a single item, not a pair. 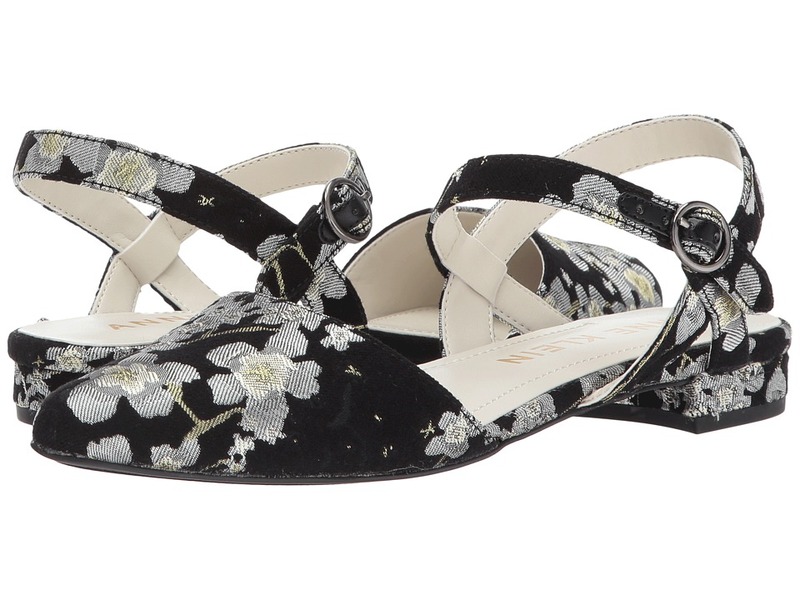 Bring a blossom to the party with the simply styled Anne Klein Marigold wedge sandal. Suede upper. Slingback ankle strap. Round-toe silhouette. Studded floral embellishment at vamp. Man-made lining and footbed. Jute-wrapped wedge heel. Man-made outsole. Imported. Measurements: Heel Height: 3 1 2 in Weight: 8 oz Platform Height: 1 in Product measurements were taken using size 7.5, width M. Please note that measurements may vary by size. Weight of footwear is based on a single item, not a pair. 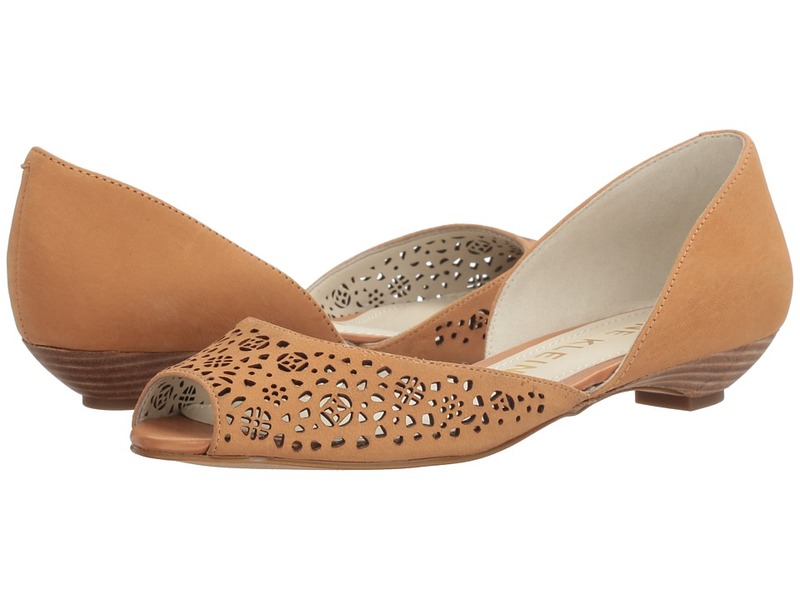 The Anne Klein Fatima is a stylish flat with radiant detail throughout. Nubuck upper with feminine perforated accent. Easy slip-on wear. Rounded toe on a d~Orsay silhouette. Man-made lining. Lightly-padded footbed. Synthetic outsole. Imported. Measurements: Heel Height: 1 in Weight: 6 oz Product measurements were taken using size 7.5, width M. Please note that measurements may vary by size. Weight of footwear is based on a single item, not a pair. Cruise from coffee to cocktails with ease in the Anne Klein Briella heeled sandals. Available in leather, nubuck or suede upper depending on colorway. Slingback strap with adjustable buckle closure. Round, open-toe silhouette. Laser-cut mandala pattern at vamp. Man-made lining. Lightly-padded footbed. Tapered, stack heel. Man-made iFlex outsole. Imported. Measurements: Heel Height: 3 1 2 in Weight: 10 oz Product measurements were taken using size 8.5, width M. Please note that measurements may vary by size. Weight of footwear is based on a single item, not a pair. Embrace eye-catching allure in these Anne Klein Lorrie platform sandals. Textile or fabric upper depending on colorway. Slingback closure with adjustable buckle strap. Round-toe silhouette. Textile lining. Man-made insole. Lightly padded footbed. Wrapped platform and block heel. Man-made outsole. Imported. Measurements: Heel Height: 4 1 4 in Weight: 13 oz Platform Height: 1 1 4 in Product measurements were taken using size 9, width M. Please note that measurements may vary by size. Weight of footwear is based on a single item, not a pair. 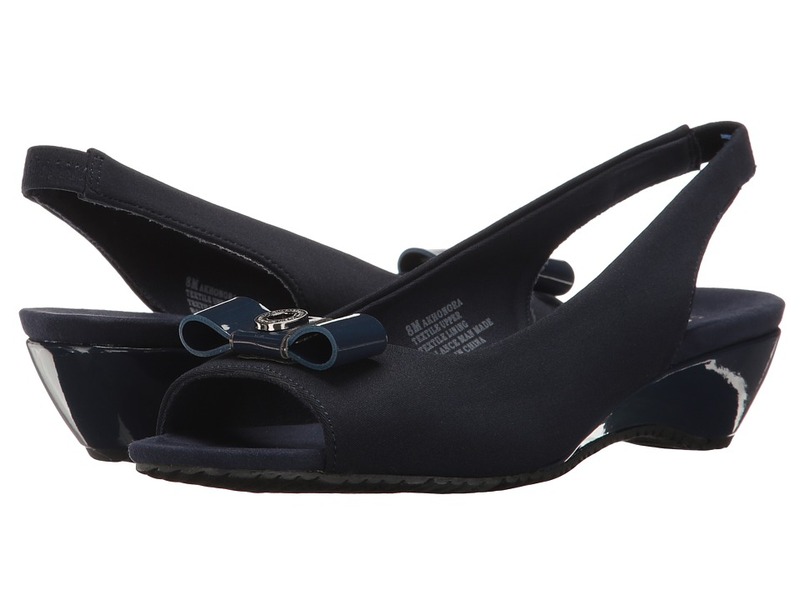 Find fashion flexibility with the smartly designed Anne Klein Maddie sandal. Perforated metallic leather or synthetic upper depending on colorway. Slingback strap with adjustable buckle closure. Round-toe silhouette. Man-made lining. Lightly-padded footbed. Wrapped, wedge heel. Rubber outsole. Imported. Measurements: Heel Height: 1 1 2 in Weight: 7 oz Product measurements were taken using size 9, width M. Please note that measurements may vary by size. Weight of footwear is based on a single item, not a pair. Go for glamorous with the unmistakably alluring Anne Klein Meredith peep-toe pump. Patent leather upper. Slip-on design. Round silhouette with peep-toe. Textile lining. Man-made insole. Lightly padded footbed. Man-made sole. Wrapped, block heel. Imported. Measurements: Heel Height: 2 1 2 in Weight: 9 oz Product measurements were taken using size 8.5, width M. Please note that measurements may vary by size. Weight of footwear is based on a single item, not a pair. 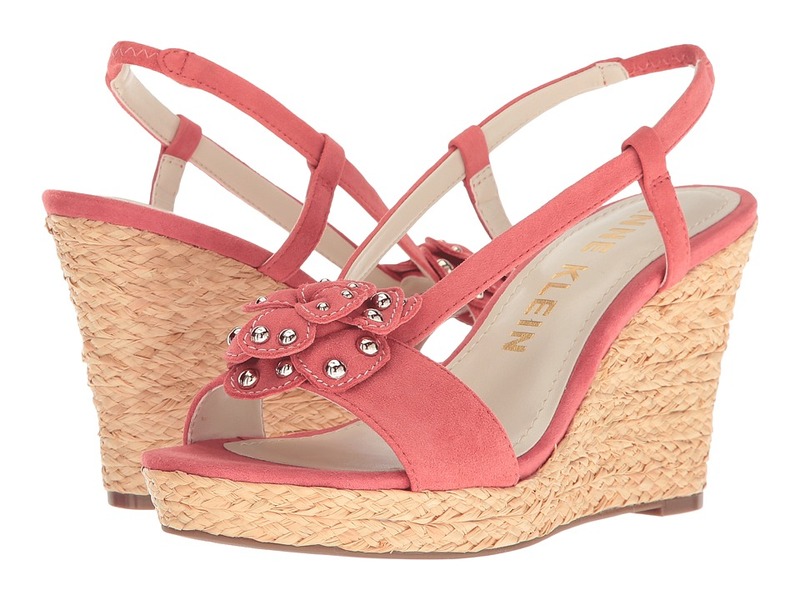 Add a touch of glamour to you daily grind in the eye-catching Anne Klein Carisma wedge sandal. Textile upper with goring inset. Back-zip closure. Round silhouette with open toe construction. Textile lining. Lightly padded footbed. Man-made outsole. Wrapped, wedge heel. Man-made insole. Imported. Measurements: Heel Height: 2 in Weight: 7 oz Platform Height: 1 2 in Product measurements were taken using size 9, width M. Please note that measurements may vary by size. Weight of footwear is based on a single item, not a pair. Eye-catching style combined with noteworthy comfort make for the perfect pairing in the Anne Klein Ulisa! Patterned textile upper. Slip-on design with crisscross elastic straps. Square-toe silhouette. Textile lining. Padded sport insole for the highest comfort. Molded micro-wedge heel. Partitioned man-made outsole. Imported. Measurements: Heel Height: 1 in Weight: 6 oz Product measurements were taken using size 9, width M. Please note that measurements may vary by size. Weight of footwear is based on a single item, not a pair. Give in to glamorous with the irresistibly alluring Anne Klein Ferdie slide. Fabric upper mesh overlay. Slip-on design with crossover strap. Point-toe silhouette. Textile lining. Man-made insole. Lightly padded footbed. Wrapped kitten heel. Man-made outsole. Imported. Measurements: Heel Height: 2 3 4 in Weight: 7 oz Product measurements were taken using size 9, width M. Please note that measurements may vary by size. Weight of footwear is based on a single item, not a pair.